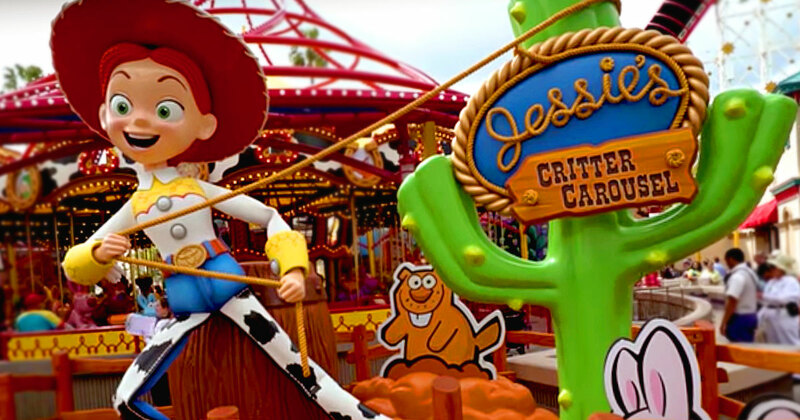 Disney never gave an official opening date for Jessie’s Critter Carousel at Disney California Adventure. The website just says April 2019. But since the ride has been in soft opening for several days now, we’re gonna go ahead and call it. Jessie’s Critter Carousel is now considered an official ride for the Disneyland Resort version of the Parkeology Challenge. To see the official list of all rides in the Challenge, CLICK HERE. Teams hoping to complete every ride in one day on the West Coast must now account for this major lynchpin attraction. Recommended strategies include hitting it right at rope drop, last minute hop on, grabbing a coveted FastPass, or riding it literally any other time of day without much of a wait. Do we sound annoyed? Maybe it’s because Jessie’s Critter Carousel replaced our beloved purple whales — the official mode of transportation for Parkeology. It’s the only way to travel. We don’t anticipate this will cause too much drama for challengers. But next month that Disneyland ride list is going to increase again. And that one… well, you might want to plan for that one. Sign up for the Parkeology Challenge TODAY! This entry was posted in Disney Theme Park News and Rumors and tagged Disney California Adventure, Disneyland, jessie's critter carousel, parkeology challenge. Bookmark the permalink. ← Is the Haunted Mansion Wolf Howl Silenced Forever? Somehow i missed the original purple whale story you linked here, so glad I clicked this just for that. Also, I still think that Star wars is going to make the Run impossible going forward, unless you finally are willing to ditch the silly transport things that aren’t “rides” in the first place.